In our neighbourhood, we’ve got a wonderful fish market that carries only sustainable, high quality fish. So when I had a recent hankering for salmon, I had the fish monger slice me up a couple fillets. On my walk home, I started playing over in my mind different ways that I could prepare the salmon. It’s kind of funny because a friend told me that for a while he’d spot me out in the neighbourhood and would say hi, but I’d never respond. He thought I was ignoring him. I wasn’t. I think he just didn’t try hard enough. Either that, or I was mulling over salmon recipes in my head. It was one of those rare, gorgeous sunny winter days and I had a little skip to my step. It was beautiful outside and inside of my head, I was slowly putting together dinner. I was in my happy place. My first concern was to keep the recipe simple and let the flavours shine. This was a costly slab of fish, so there was no need to hide it under heavy sauces or flavours. My normal go-to salmon (or trout) recipe is this slightly asian one with soy, blood orange and ginger. It’s simple, no doubt, but I wanted something different. Instead, I started with salty, brined capers. Sharp red onion and local garlic that came wrapped in beautiful purple papery skin came next. And I discovered half a lemon and half an orange in the fridge. Yes! I was sure the flavour combination would be perfect. And it was. 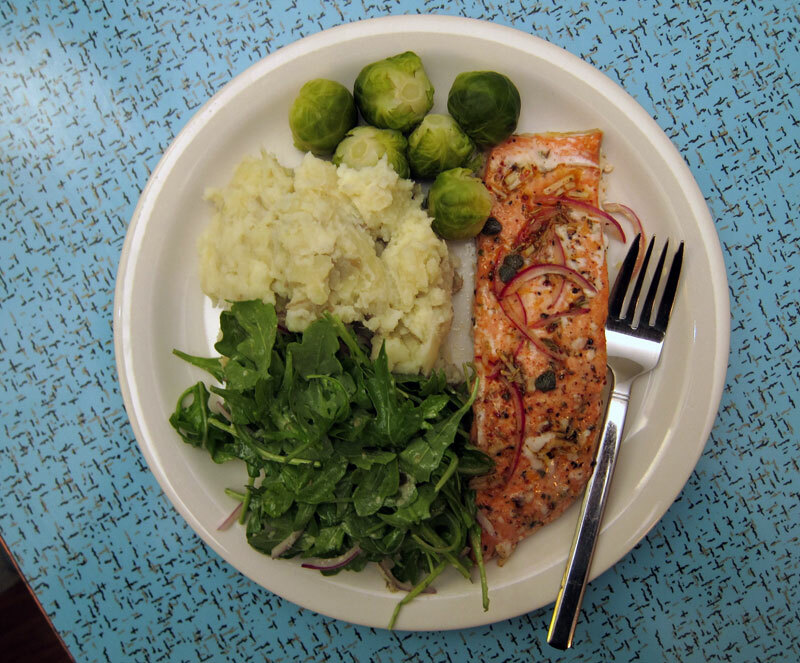 The salmon was served with my favorite arugula salad, mashed potatoes and some steamed brussels sprouts. We cracked open a nice bottle of chilled white wine and ate happily. I cooked the salmon in a cast iron skillet which isn’t necessary for this dish to work. Use a baking sheet or your favorite oven dish. The parchment paper liner makes clean-up a snap. Line a cast iron skillet with parchment for easy clean up. Scatter half of the onion slices on the bottom of the pan and place the salmon fillets on top, skin side down. Season with salt and pepper. Scatter remaining onions on top of the salmon, along with the garlic, capers and lemon zest. Pour lemon juice over top and drizzle with olive oil. Place in oven and cook for about 8-12 minutes or until salmon has just cooked through. Salmon will flake easily when done. This salmon recipe is so reminiscent of Sicilian cooking. Yum, it’s the capers for sure. I’m so jealous of your access to fresh, sustainable fish. I haven’t enjoy fresh fish in a while. It’s so darn costly here. I get wild Pacific canned salmon or frozen. I don’t even want to touch fresh Atlantic salmon. I’m really craving salmon and this looks so good. I love the combo of ingredients – capers, red onion, citrus. Perfect! I love capers and citrus with salmon! A perfect pairing. Well this looks pretty freakin’ perfect. Yum! Totally true, Joanne! I’m pretty lucky because another sustainable seafood shop opened up in the adjoining neighbourhood! I’ll have to walk over and check it out. I too don’t buy Atlantic salmon. Thanks Joanne, I agree – love capers & citrus!! I wish I had access to fresh fish like that, too! My dream would be to live near the water and pick my seafood up from the docks 🙂 This simple preparation sounds excellent for enhancing a beautiful piece of fish! Well Nicole, then you should come to Vancouver. On Saturdays there’s Fisherman’s Warf on Granville Island that is close to downtown – where you buy fish right on the docks. And a 25 minute drive away is the little fishing village of Steveston with a great fish market where you buy fish off the boats. We’re pretty lucky out here!! I’ve never thought to cook salmon in a cast iron skillet! What a good idea. Plus, capers and lemon are always a win with seafood. This is AMAZING! 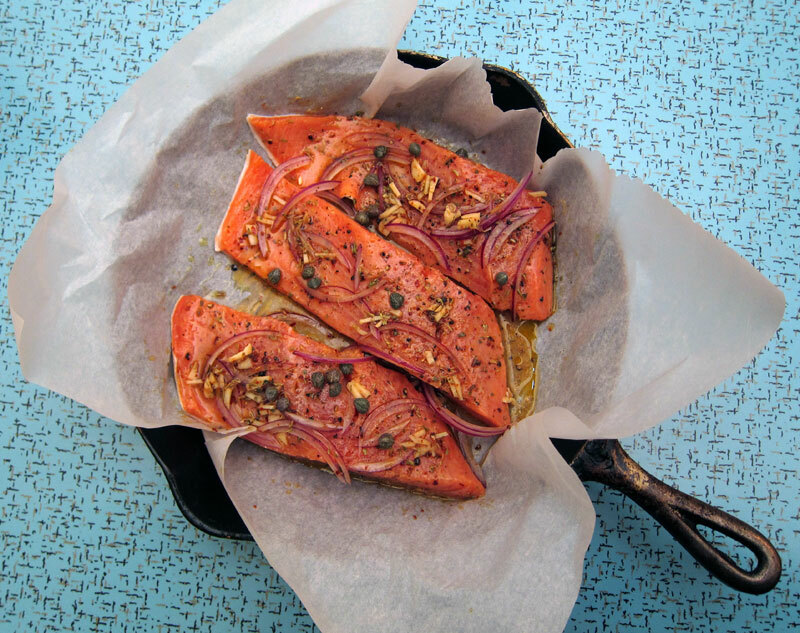 I made this last night – so easy to prepare and the salmon comes out so moist and flavourful. The capers, citrus and red onion are a great combination. Looks wonderful! Got to love salmon with red onions and capers. Kate, I’ve made salmon in a cast iron skillet before without using parchment and it works out fine. I just wanted easy clean up! Caterina, so glad you enjoyed it. Thanks Kasey, it’s a great combo here. The colour of that salmon is just mesmerising! I love what you’ve done with making the salmon do all the work and pair it up with capers, onion, and citrus to keep it light. Ibbs, so glad you enjoyed it!